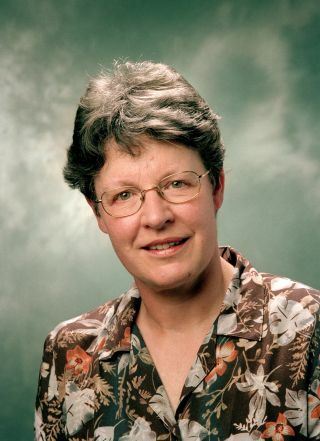 Jocelyn Bell Burnell, who discovered pulsars in 1967, will receive a $3 million Special Breakthrough Prize in Fundamental Physics. Jocelyn Bell Burnell is about to get some much-deserved recognition, and a pretty big chunk of change to boot. The British astrophysicist will receive a Special Breakthrough Prize in Fundamental Physics, Breakthrough Prize representatives announced today (Sept. 6). The $3 million award recognizes not only Bell Burnell's 1967 discovery of the weird, fast-spinning stellar corpses known as pulsars but also her scientific leadership in the 50 years since then. In 1967, Bell Burnell (then Jocelyn Bell) was a graduate student at the University of Cambridge in England. One day that November, she noticed something strange in the data collected by a radio telescope she and her thesis supervisor, Antony Hewish, had helped build — a pulse that repeated every 1.3 seconds or so. The signal was so odd that Bell Burnell and her colleagues playfully dubbed it "Little Green Man-1," after the putative aliens that might have generated it. But Bell Burnell soon spotted other, similar pings, suggesting that the source was a naturally occurring cosmic object. Pulsars are fast-spinning and highly magnetized stars. See how they work here. Pulsars don't actually pulse, however; they emit beams of radiation constantly. The apparent pulsing is an artifact of pulsars' rotation, which brings the beams into line with our planet at regular intervals. "Jocelyn Bell Burnell's discovery of pulsars will always stand as one of the great surprises in the history of astronomy," Edward Witten, chairman of the selection committee for the Fundamental Physics Breakthrough Prize, said in the same statement. "Until that moment, no one had any real idea how neutron stars could be observed, if indeed they existed," Witten added. "Suddenly, it turned out that nature has provided an incredibly precise way to observe these objects, something that has led to many later advances." For example, scientists have used pulsars to test Einstein's theory of general relativity, and the precision of their repeating signals has allowed astronomers to construct detailed maps of the cosmos. And the $3 million will allow her to keep giving back. "The plan is, broadly, to use the money to fund research students — graduate students, particularly students from underrepresented groups in physics," Bell Burnell told Space.com, adding that she's been formulating that plan with the Institute of Physics, the London-based professional society for people in the field. "I feel that I made my contribution in part because I felt an outsider," she added. "I was one of very few women, and I wasn't from the southeast of England, the affluent part of the country. So, I think increasing diversity of the workforce actually allows all sorts of things to develop." Bell Burnell also said the award caught her completely off guard. "When I was told about it, I was absolutely speechless, which is most unusual for me," she said. "It was not something I had ever even faintly dreamt to imagine I might get, so it was a wonderful surprise." Bell Burnell will officially receive the award on Nov. 4, during the 2019 Breakthrough Prize ceremony in California's Silicon Valley. Laureates of the organization's annual prizes in physics, life sciences and mathematics will also be honored at the ceremony, as will winners of the Breakthrough Junior Challenge. Bell Burnell will become just the fourth recipient of the "special" physics prize, which can be awarded at any time for extraordinary achievement. The others to be so honored are Stephen Hawking; seven scientists at the European Organization for Nuclear Research (known by its French acronym, CERN) who were crucial to the discovery of the Higgs boson; and the Laser Interferometer Gravitational-Wave Observatory (LIGO) Collaboration, which in 2015 made the first-ever direct detection of gravitational waves.